South Korea on Sunday confirmed that their captain Ki Sung-yueng will not be able to play in their final group stage match against Germany at the 2018 FIFA World Cup due to injury. South Korea are scheduled to face defending champions Germany in their last Group F match at Kazan Arena in Kazan, Russia, on Wednesday. 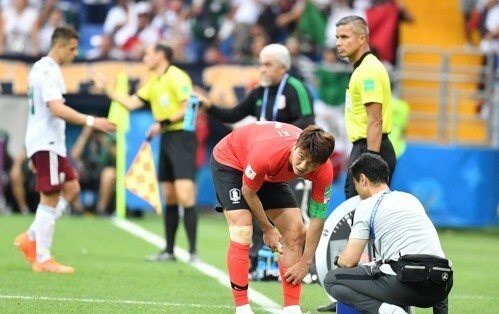 A national team official, however, said Ki, South Korea's midfield control tower, will miss the match with a calf injury. "A medical inspection at a hospital showed that Ki damaged his left calf muscle," the official said ahead of national team training at Spartak Stadium in Lomonosov, a suburb of Saint Petersburg. "He needs two weeks of treatment." Ki started in South Korea's second Group F match against Mexico at Rostov Arena in Rostov-on-Don on Saturday. During the second half, the Swansea City midfielder was seen limping after he was brought down by a Mexican player. After the match, the 29-year-old South Korean passed through the mixed zone on crutches without speaking to reporters. Ki has been one of the most influential players for the Taeguk Warriors at Russia 2018. He is the most experienced player on the South Korean squad with 104 caps.